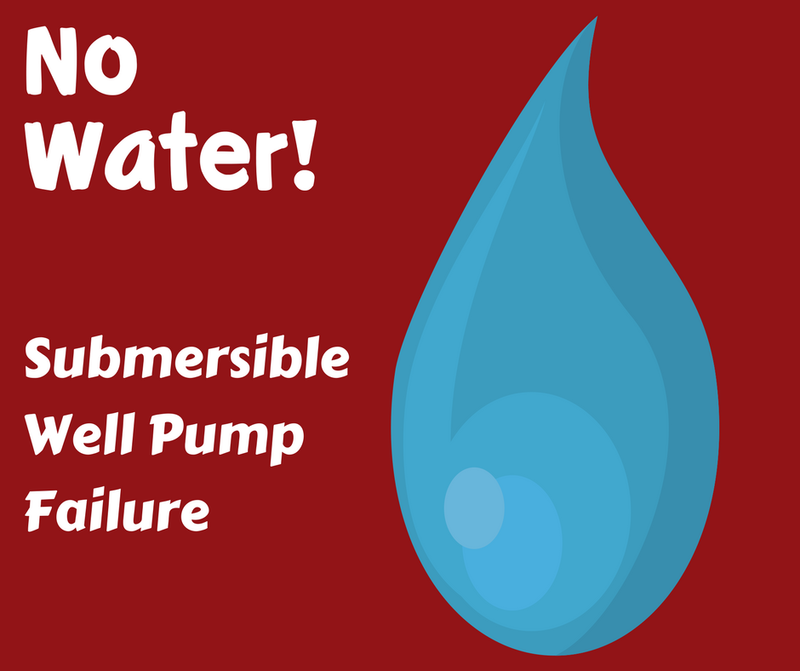 Your submersible well pump is the heart of your well water system. It is fully submerged in your well and includes a hermetically sealed motor close-coupled to the body of the pump. A submersible pump pushes water from your well into your home. Water is pulled into the intake of the pump and the impeller then pushes the water through the diffuser. From there it is brought up to the surface and piped into your home. One advantage of a submersible pump is that because it is submerged, it is self-priming. Submersible pumps are also energy efficient thanks to their design. Because of water pressure pushing water into the pump they don't have to use a lot of energy to move water making them extremely energy efficient. The typical submersible pump is cylindrically shaped, about 42-inches tall and most are 4-inches in diameter. Once your well is drilled, the pump is attached to a flexible pipe and lowered into the well casing until it is fully submerged. Pumps are placed at the bottom of the well and push water sometimes hundreds of feet into your home. The pump relies on atmospheric air pressure to force water into the pipe and through the pump. Your pump delivers water into a pressurized tank in your home which is regulated by a pressure switch mounted on the well pipe where it enters the tank. When water is drawn from the tank, the pressure decreases which causes the switch to call for more water from the pump. It begins pumping and refills the tank until maximum pressure is achieved. The pump is then shut off until the pressure again goes down and the cycle repeats. Multiple stage pumps are often used for underground applications such as your water well. Because they are fully submerged, the water helps to cool the motor meaning no outside cooling, or cooling chemicals are needed. Single stage pumps are used for most home and light industrial pumping such as aquarium filters, sewage pumping or sump pumps for drainage. They are not used in residential water well applications. Because they are an enclosed system, submersible pumps are generally very energy efficient and can have a long productive life. When they do fail, the cause is typically the seal. Seals can corrode over time and allow water to seep into the motor which can cause the motor to fail. In this instance, the most cost-effective choice is to replace the pump. • The most common sign of failure is the absence of water at the faucet. If this happens, the first step is to check the circuit breaker. If it is switched off, turn it back on and check your water. If you still are not receiving water the problem may lie with the pump or the pressure switch on your storage tank. For this issue, it's best to contact your well water professional. • Abrupt pump failure is not common. Often what may appear to be a problem with the pump is actually a well-related issue. Weather conditions like drought can lower the water table in your well. This can affect how the pump operates. To check this, try not using your water for several hours to allow your well to replenish. After a few hours, open the faucet and check for flow.If your water flow is normal, the issue may be that the wells replenishment rate is low due to natural conditions. Your well water professional may be able to resolve the issue by lowering the pump deeper into the well or using other methods like hydrofracturing to improve replenishment rates. • Another sign of possible pump failure is if your water is “aerated” at the faucet. Sputtering can signal that your pump is failing, that your pump is above a lowered water table, or other issues like a bad check valve or cracked pipe. Again, if you are experiencing this problem the best solution is to contact your well water professional. • If you notice a sudden change in water quality, for example, cloudy or muddy water at the pump, you may have sediment entering the pump. This can cause the pump to work harder and create a corrosive environment that can wear down the pumps internal elements. Again, this can often be remedied by lowering the pump deeper into the well. • Finally, if you notice a spike in your electric bill it could indicate that your pump is working overtime. A pump that is constantly running can indicate several potential problems including a failing pump. The best way to keep your pump working efficiently is to schedule annual maintenance inspections with your well water professional. This can be done at the same time as your annual water quality testing. Your well water professional will visually inspect your water system including the well, pump, pressure tank, electrical and plumbing connections. Catching a problem early can often result in a lower-cost repair rather than a replacement. Your submersible pump is the heart of your water system. Keeping it running in peak condition can ensure that you and your family will enjoy the benefits of clean, pure water, trouble free for many years to come! If you have no water, contact Skillings & Sons. We will show up in our rolling warehouse, inspect your well pump and have your water flowing quickly. Older PostWhere Should Homeowners Place a Water Well On Their Property?